Polymer version ceiling loudspeaker is a profitable and modern, made of white Polymer-POM plastic with a high efficiency and a high-quality 165 mm full range loudspeaker chassis. This attractive polymer loudspeaker includes the new "one-hand-easy" mounting principle: innovative spring clamps with cropped leg spring for a quick mounting, increased clamp force and shortened tension distance. 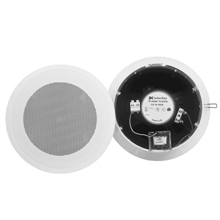 This ceiling loudspeaker has all the advantages of the new technical polymer plastic POM because of the excellent shock-resistance and the UV-resistance. The Polymer loudspeaker looks new even after years of usage and the low weight of the material makes an easy mounting possible. Most importantly, the profitable price of the POM is an advantage you should exploit. Additionally, we guarantee a fire resistance according to UL94-HB and the International Protection IP44.